In 1895, Mr. Wakmann was born inRussiawith Jewish origins. 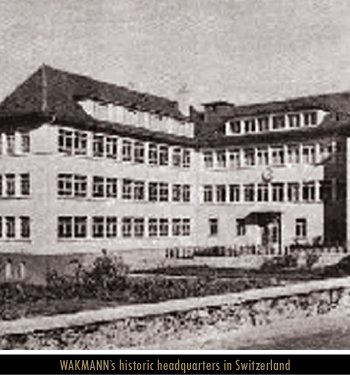 In the early stages of World War II (WWII), Mr. Wakmann started his watch business inPortugaland had been representing several high-end European watch brands. At the same time, warfare was spreading acrossEuropein rapid pace. During the Holocaust, the Wakmann family devoted great efforts in assisting refugees from the Nazi horror. During WWII inNorth America, many American watch companies were put at a disadvantage. Their production was switched to war products, while the Swiss watch manufacturers produced watches for war efforts and civilians. As a result, the U.S.government decided to support the American watch industry. The Swiss Watch Import Act was subsequently formed, and the U.S. Department of Commerce started to impose custom duties on high-end imported Swiss watches. Mr. Wakmann quickly recognized that this was an excellent opportunity to start his professional watch business inAmerica. Therefore, he travelled across the Atlantic Ocean, fromLisbon,PortugaltoNew York City, with the aim of establishing his new business inNorth America– to fulfill his lifelong dream. 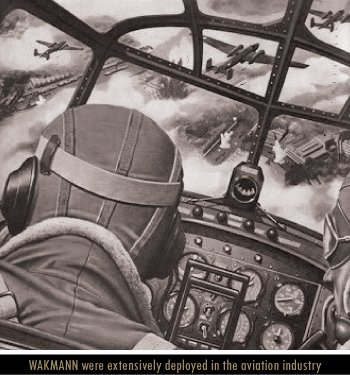 Wakmann was appointed as the official producer and deliverer for the U.S. Military during WWII. This appointment was a further testament to the excellent quality of Wakmann watches. 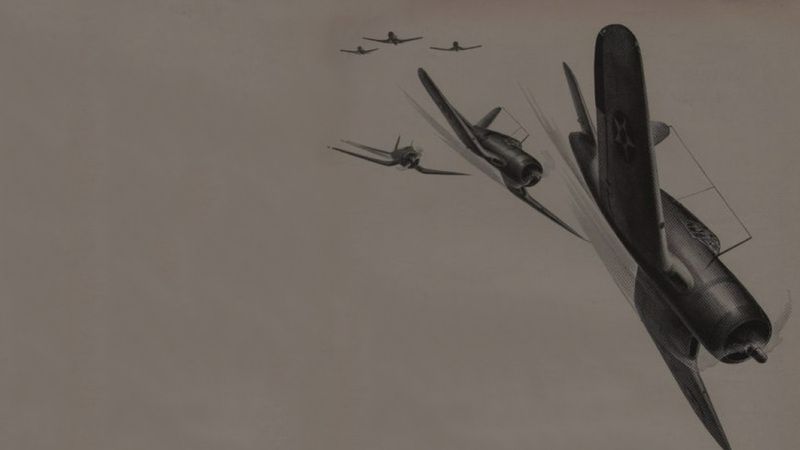 Airforce technologies evolved rapidly during the ongoing warfare in the 1940s. New innovations include jet aircrafts, radar and ballistic missiles. 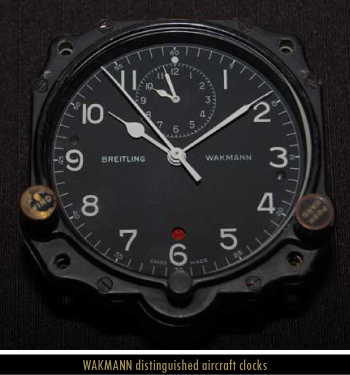 During the same period of time, Wakmann also started to develop professional timing instruments for the aviation industry, such as cockpit clocks for both military and commercial aircrafts, and professional wristwatches for pilots. Following rapid product and design breakthroughs, Wakmann watches soon gained the reputation as precise high-end timepieces, and became status symbol among customers. 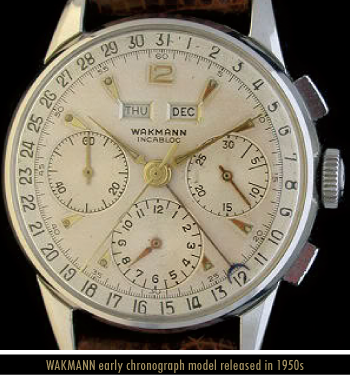 In 1947, Wakmann Watch Company ofNew Yorkwas officially listed in the U.S. Stock Exchange and the brand received greater public approval. In October 1947, Breitling Watch Corporation ofAmericawas formed inNew York. It was a joint venture between Wakmann Watch Company and the renowned Swiss aviation timepiece manufacturer Breitling Watch Company. - Chronographs and multi-purpose technical watches. - Complete line of aviation timepieces, made in accordance with the latest military and commercial specifications. - Full assortment of ladies’ and gentlemen’s dress and utility wrist watches. The Sixties (1960s) was a decade of social revolution and passion. In theUnited States, two huge social movements swept across the whole country: the hippies “counterculture”, and feminism (Women’s Liberation) that demanded more freedom and rights for women. Women’s fashion at that time reflected the influence from such movements, and new fashions included mini-skirt with white go-go boots, sleeveless shift with stiletto-heeled shoes, bell-bottom jeans with sandals, etc. Wakmann Watch ladies collections at the time was marked with ground-breaking designs which included Incabloc shock-resistant movement, sapphire crystal, tailored bracelet, weave design cover opens to reveal concealed watch, amongst many others. These new designs were specifically aimed to create a perfect match between Wakmann ladies watches and the 1960s fashion trend. Other new introductions included the 14K gold and diamond bracelet watches collection – fitted with 5 to 40 diamonds, and a choice of 13 different bracelets. Many elite athletes emerged with brilliant performances in the 1970s. Billie Jean King defeated her male component Bobby Riggs in the “Battleof the Sexes” which was nationally televised. Mark Spitz set seven World Records to win a record seven gold medals in the 1972 games – an unprecedented feat for the Olympics swimming events. Gymnasts Olga Korbut and Nadia Comaneci both delivered legendary performances in the 1970s Olympics. The 1970s also marked a boom in the popularity of distance running and jogging. In line with the global sporting trend, Wakmann launched the new sporting collection in the 1970s. New additions included waterproof watches (laboratory tested to666 ft.and999ft. depth), bezel indicating lapsed time in 24 hours, double lock crown for extra protection, etc. 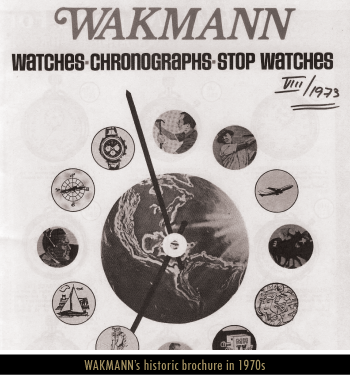 For accurate timing of sporting events, Wakmann launched the advanced “Exclusive central register timers” collection. This latest development enabled split-second timing with central registers that doubled the timing capacity from 30 to 60 seconds, and improved the legibility by 85 percent. Half a century ago, Mr. Wakmann travelled toAmericato fulfill his lifelong dreams. 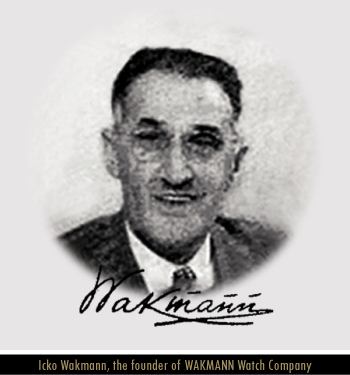 His belief and strong determination led to the establishment of Wakmann as one of the leading watch brands inAmericarenowned for its reliable and quality timepieces. In the 21st century, Wakmann Watch continues to explore new horizons, providing modern, practical and durable wrist watches for both men and women. Wakmann has now pioneered the advanced Swiss night reading technology and integrated self-powered micro gas lights onto the dial and hands of all its watch collections. This exceptional function enables wearers to always read Wakmann watches quickly and easily in any environment (including complete darkness). The professionals dare to dream, have faith in their own beliefs, and treasure every important moment of their lives. Wakmann Watch share similar values, and is truly the reliable partner for professionals.